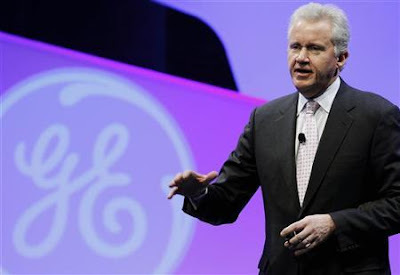 General Electric CEO Jeff Immelt said the company is committed to electric vehicles despite some soft early sales. "We're committed to the long-term development of this," Immelt said in a keynote address Tuesday at the SAE World Congress in Detroit. He acknowledged that some "may be disappointed in the adoption of the electric vehicle." The auto industry must get battery costs down to make EVs more competitive — as well ensure that the infrastructure is present to recharge vehicles. "the near term challenge is going to be all about cost," he said. For instance, the battery used in an all-electric vehicle such as the Focus Electric, Ford's first all-electric passenger car, can cost between $12,000 and $15,000, company executives say. That would represent around a third of the Focus Electric's overall price of around $39,000. By 2020, Ford expects hybrids, plug-in hybrids and electric vehicles will comprise 10 percent to 25 percent of its sales as oil prices rise and government standards on fuel economy and emissions grow stricter. Immelt is convinced the market for electric vehicles will not remain a small niche, adding that GE does not invest in technologies simply because they are popular trends. "Novelties don't work in business," he said.